(Lanka e News -11.Aug.2018, 11.45PM) The justifiable attack launched recently by the enraged public who went chasing after the leaders of the trade unions of the Railways when the railway drivers staged a sudden strike causing untold harships to the public was described by Kurunegala district M.P. 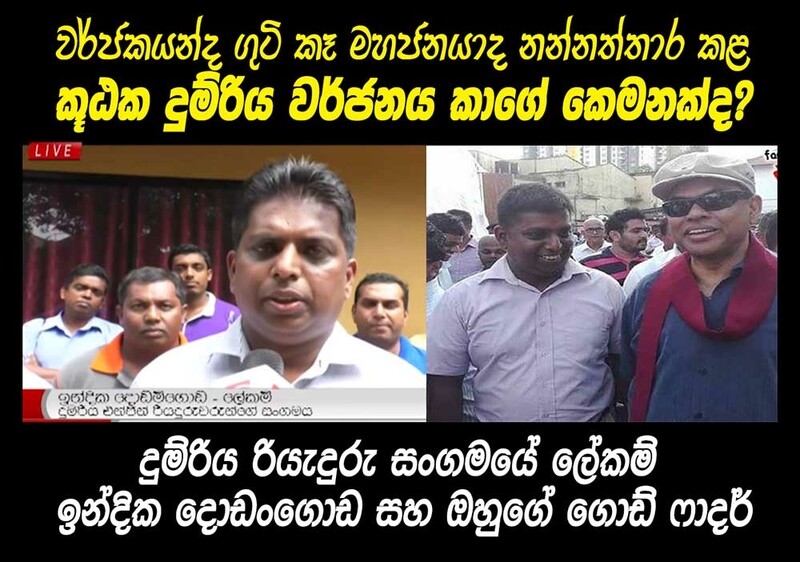 Mahinda Rajapakse as an organized attack by the government when he attended a death commemoration ceremony of late Richard Pathirane at Galle on the 10 th. Mahinda made this outrageous and irresponsible announcement some days ago after the incident when it came to light that the strike was organized by the lackeys and stooges of Basil Rajapakse (the photographs herein are testimony that Indika Dodamgoda , the secretary of Railways drivers union is a stooge of Basil Rajapakse). The statement made by Mahinda Rajapakse (who could not provide any relief to the masses during his tenure of office as president while allowing all his ‘men’ to rob freely along with him and his family) who has no feelings for the suffering and despairing people any day confirms he identifies the genuinely affected public also as a hired group like his that coughs for payment.